There is something special about cruising up a river in a kayak. It is quiet, relaxing, and for even the moderately fit, fairly easy exercise. 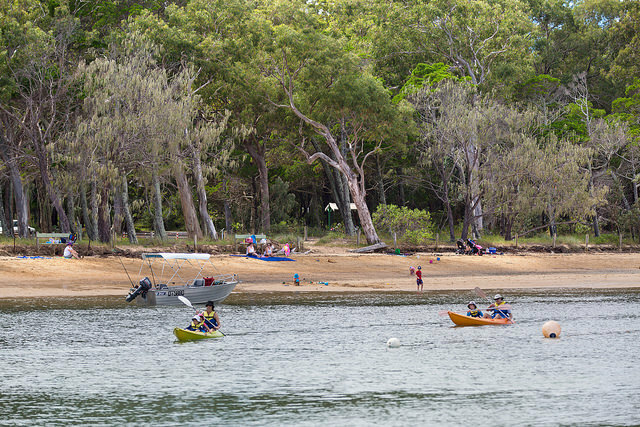 But not everyone has a kayak, so here are 5 spots around Brisbane where you can easily hire a kayak and go for a paddle. Most places that hire kayaks out, provide sit on top kayaks. These are both stable and fairly safe. Kayaks that you sit in require more skill, because you have to learn how to right the kayak if it capsizes or get out of it when it is upside down. Sit on top kayaks also will not sink by being swamped. In addition, by law the kayak rental places need to provide you with life vests. So kayaking is a safe activity for the whole family. Stand up paddle boards are also now very trendy and places that rent out kayaks also rent out stand up paddle boards. While these are fun, they are far more tiring, but you can also give these a try as well. 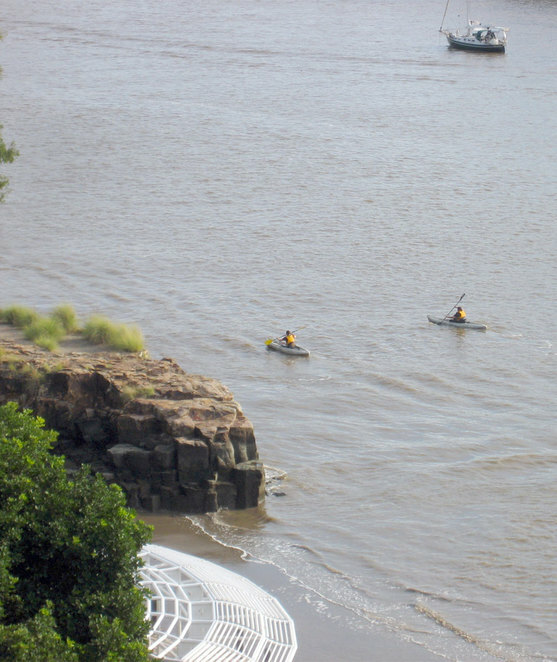 Kayaking Brisbane river is one of those bucket list items people in Brisbane have, but may never get around to doing. 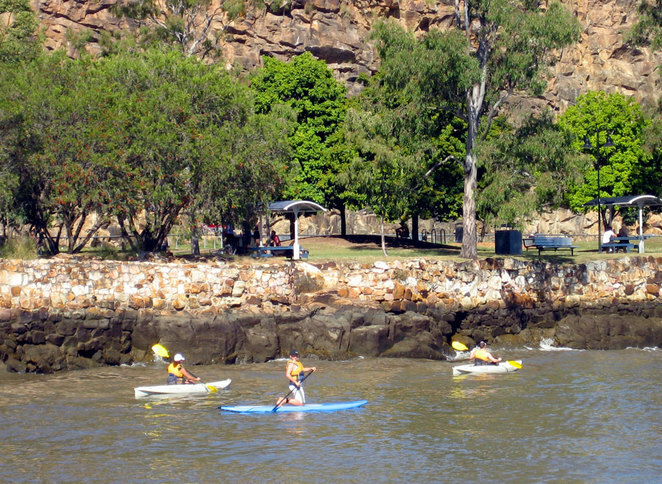 Riverlife at Kangaroo point hires out kayaks and standup paddle boards 7 days a week from 9am to 5pm and on Friday and Saturday nights. 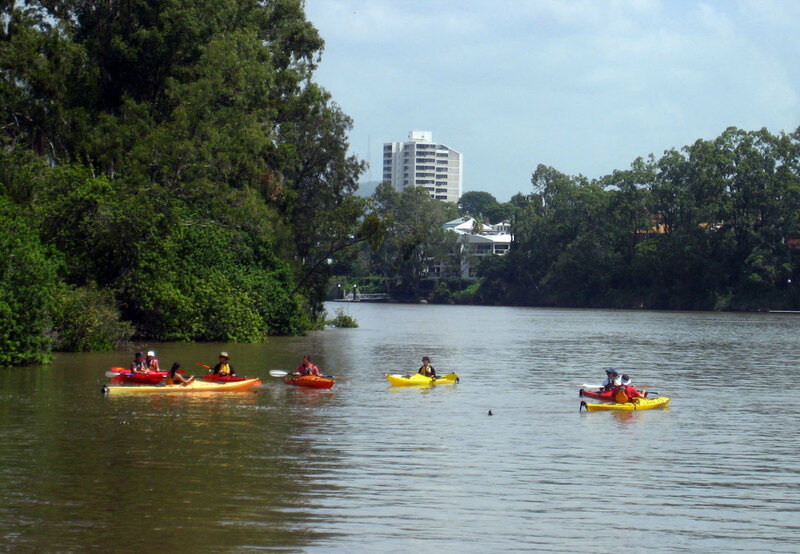 The highlight of kayaking Brisbane river is the wide variety of scenery which include the city front, south bank, City Botanical Gardens, kangaroo point cliffs and the Story Bridge. If you hire the kayaks for longer, you can head up or down the river further. Riverlife also organises kayak tours. Once of the most popular ones is a night paddle. The kayaks are lit so they are safe on the waterway at night. Part of the tour includes a barbecue with prawns and a selection of beers and wines. 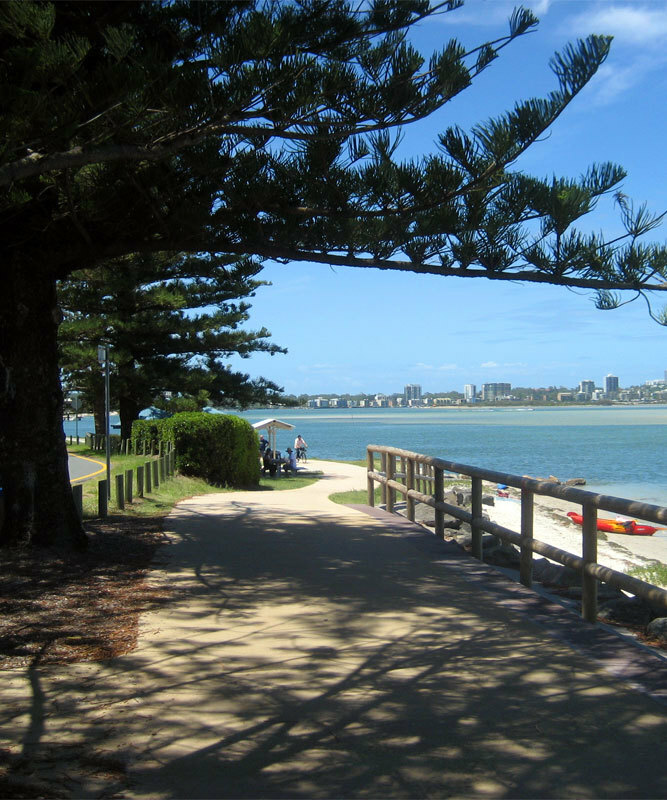 Bribie is a wonderful island just north of Brisbane. Most of the island is a national park and the Southern end is suburban. It is separated from the mainland by Pumicestone Passage. This quiet waterway is a kayaker's dream. It would take a very experienced and fit kayaker to do the whole passage, but paddling across is perfect even for beginners. On a normal day the passage is calm though there is some current from the tide, but you can paddle out against the tide and float back with the tide. On a great day, Pumicestone Passage is as smooth as glass. Even on blustery days where the ocean has huge waves, the passage itself remains navigable by even inexperienced kayakers. My favourite spot to kayak from is from Golden Beach in Caloundra across the narrow section of the passage to the far north end of the island. Once across, it is just a short walk across the spit to the ocean side of the island. You can hire kayaks from Golden Beach Hire and Bill's Boat & Bike Hire. The southern end of Pumicestone Passage has several places where you can hire kayaks. The distance across is about 2 kms, though you can also just kayak up and down the passage. 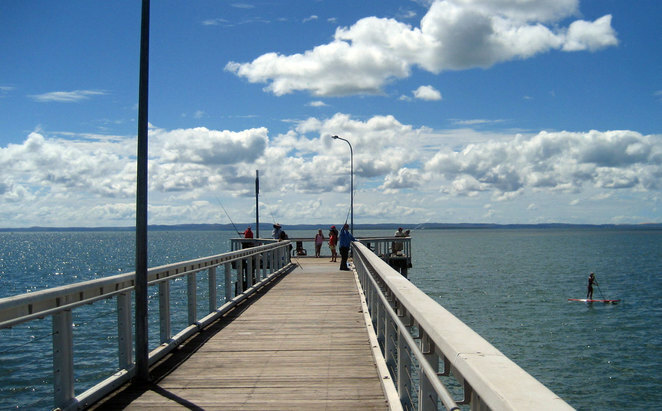 On the mainland side try Bribie Passage Kiosk & Boat Hire. 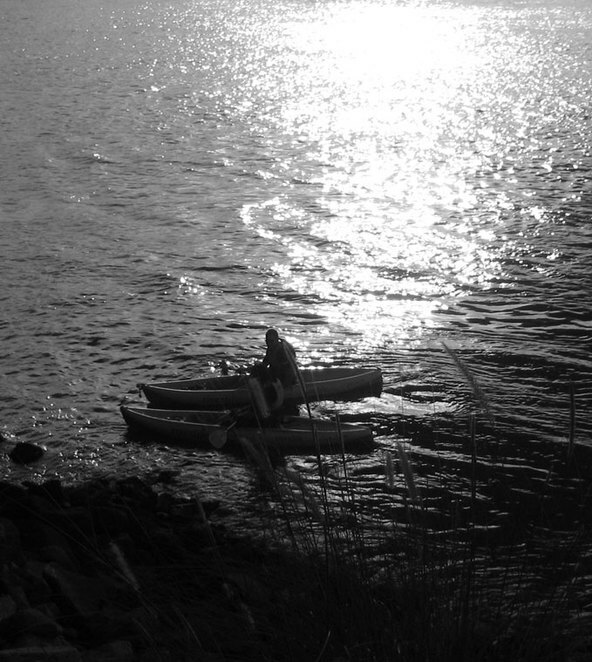 If you want to hire a kayak on the island side try contacting 24at who provides a mobile kayak delivery service. One of the great little locations to hire kayaks is at Manly. This location provides a range of different options for kayaking. 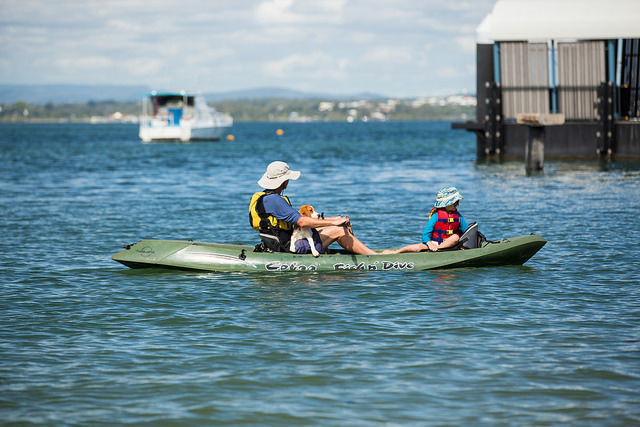 Moreton Bay Hire Boats has single and double kayaks and will provide you with advice where best to kayak. One choice is to head north to the harbour at Manly. Though there are most interesting options. Many people paddle the 2 kms over to Wellington point and the lovely King Island. This bay area is full of marine life. You are likely to see sea turtles and Dugongs. Dolphins also visit the area, though I am not sure how often they come in close to Manly. 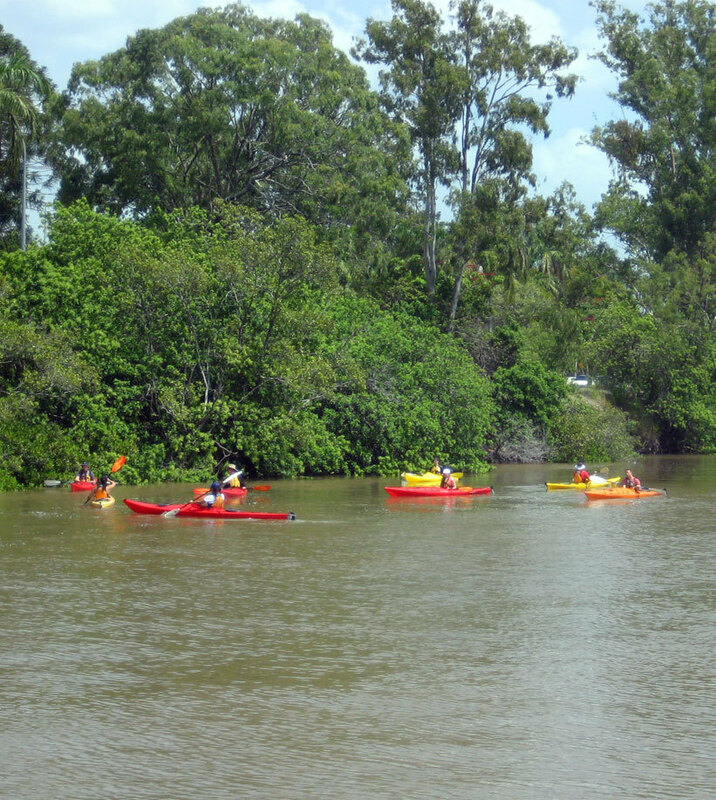 You also have the option of paddling up mangrove lined Tingalpa Creek. This is a popular little trip for kayakers, especially when the sea is a little rough. 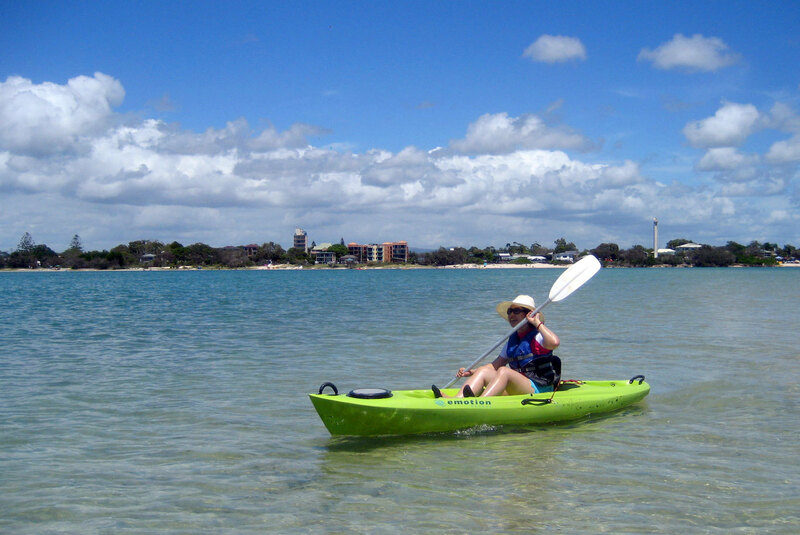 Another great Moreton Bay kayaking location is Coochiemudlo Island, which everyone refers to as Coochie Island. This lovely little island is a great relaxing escape just off the coast. With most of the coastline being beach, it is a fun location for aquatic activities. A common kayak trip is to paddle around the island which takes about 2 hours. However, you can just paddle out into bay. Coochie Boat Hire rents out kayaks. 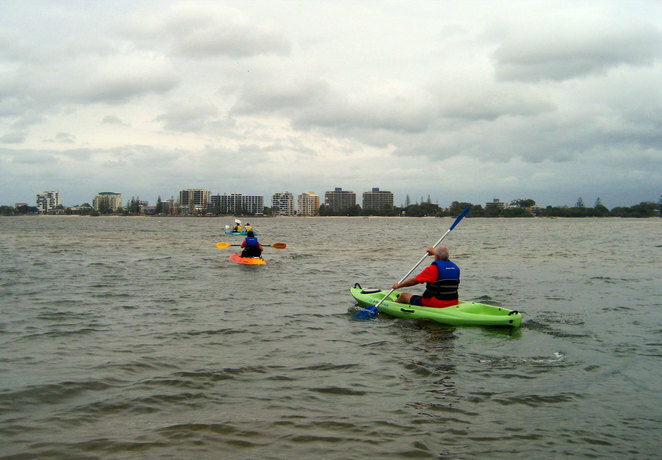 For people with their own kayaks, you can paddle the 1 km trip out from Victoria Point. 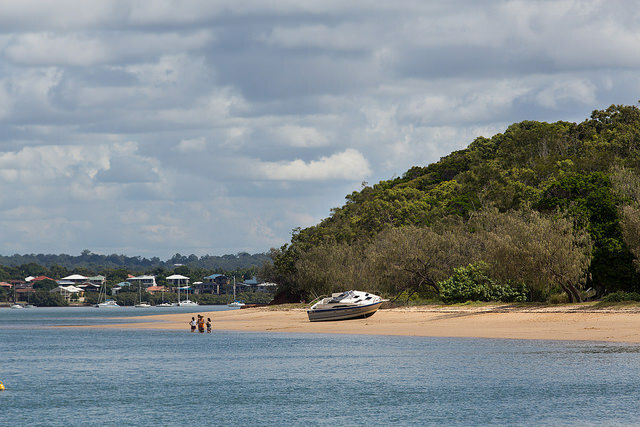 Lake Moogerah is where Brisbanites go to play on the water. This dam supports multiple activities, including camping, hiking, fishing, water skiing and boating. 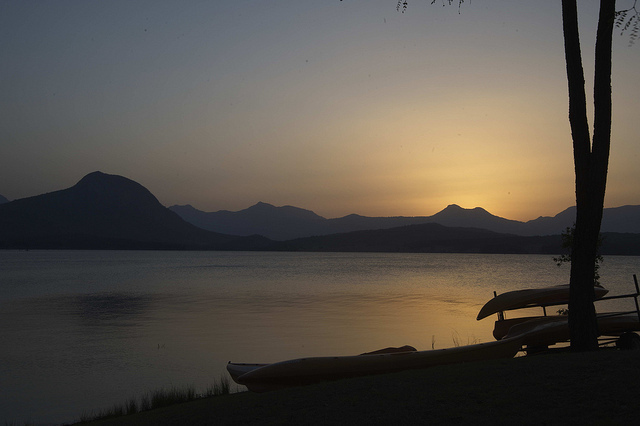 You can also hire kayaks from Lake Moogerah Caravan Park and Camp Moogerah. Generally, lake kayaking means lots of open and calm water with numerous little bays and inlets to explore. 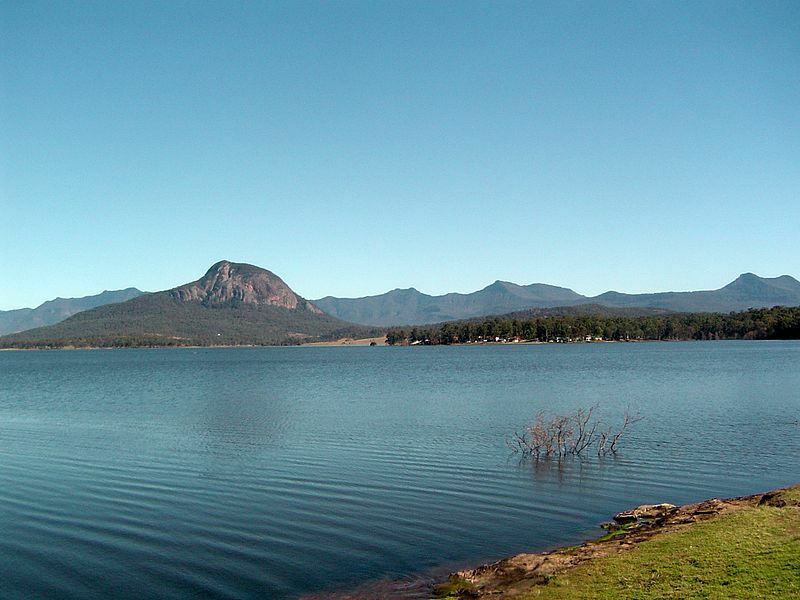 Lake Moogerah has one major drawback, and that is that you are sharing the lake with powered craft, especially the water skiers who come to the lake to specifically go very fast. How about the upper Brisbane River with a number of launching points between Fernvale and the Weir above Colleges Crossing? Little known is the fact that fresh water for Brisbane's water supply is released from the Wivenhoe Dam each day and collected again downstream at the Weir. So the water quality is excellent, the wildlife abundant and the section around Pine Mountain hosts the very last remnants of the rainforest which once stretched from the upper reach of the river to the mouth.